When the months are cold, many of us enjoy rich, hearty, stick-to-your-bones comfort dishes. But the lower temps doesn't mean you can't enjoy lighter, veggie-based dishes. While this traditional Spanish menu is perfect any time of year, it's especially good after the holidays! The entire menu can be made ahead of time except for the fried potatoes, which are best served immediately after making. This tapa is light, easy and delicious -- and no cooking required! It is about as simple as opening a jar of peppers, a can of tuna and chopping green onions and olives. Regardless of your cooking expertise, you can easily make this dish. It is one of those classic Spanish tapas that's perfect any time of year when you want a light start to the meal. Although this dish is often served as a tapa, it can also replace a standard green salad any day of the year. 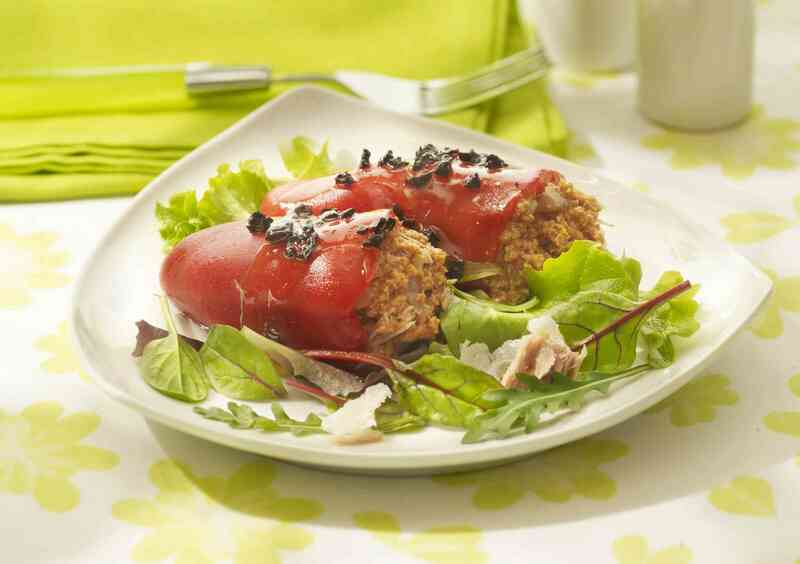 Even people who think that they don’t like eggplant or tomatoes have raved about this dish! The only cooking involved here is grilling slices of eggplant under the broiler. The rest is chopping some tomatoes, garlic, green onions, and garlic, then mixing the vinaigrette. Make it ahead and allow it to marinate before serving. Pollo a la Riojana - Rioja-Style Chicken (c) 2007 L. Sierra Licensed to About.com. The northern region of Spain called La Rioja is best known for its high-quality wine production, but the cuisine of this area is delicious as well. The winters in La Rioja are cold, so they know what foods will warm you up. Chicken cooked in white wine and flavored with garlic, red peppers and Spanish chorizo make a flavorful winter stew. Serve with homemade french fries and plenty of bread to soak up the sauce. Homemade french fries are a popular side dish in every region of Spain. They are served with just about every main course and are tasty, especially when fried in olive oil. There is really no trick to make these potatoes and no special fryer is required. Use a large, deep frying pan and keep a close eye not to burn the oil. This delicious almond cake is named in honor of Santiago (St. James), the patron saint of Spain. It is made with lots of ground almonds, sugar and a bit of flour. A small slice of this flavorful cake with a cup of espresso is a delightful way to end a wonderful Spanish dinner.